When I say OFC, does it ring a bell to you? It’s a drug, and I’m completely addicted to it! More seriously, it’s a game of cards that grows on you, and it’s called open-face Chinese poker (OFC). I’m playing hundreds and hundreds of hands every day, and got so much into the game that I became an ambassador for Tonybet Poker, the only site where you can actually play OFC cash games and tournaments. There is also a major championship in Prague at the end of the year, and I wouldn’t miss it for the world. In order to maximize my knowledge, I did some research on OFC, and since the available material is scarce, here is my personal little guide to the game. Over the next few weeks, I’ll go over the history of the game, basic rules, starting strategy advice, recommendations for every OFC format (Pineapple, Progressive, and Deuce-to-Seven), anecdotes from players, and finally, some more advanced strategies. Enjoy the Fantasy Ride! Chinese poker is a relatively young game and still evolving, and very much enjoyed by many poker players. Most of the high rollers we know are all playing this game, too! A few years back while Texas hold’em was becoming popular and exploding all around the globe, a new game actually appeared on the side, and back then it was called “Russian Chinese Poker,” probably due to the large group of Russian players hooked to it. For many poker players, including myself, the discovery of this new game was completely refreshing and exciting. Indeed, we would find in it everything we loved so much about poker — cards, intellectual challenge, risks, rewards, and of course, money. But while in hold’em we have to fold a majority of hands, here in open-face Chinese we get to play every hand! It’s the beauty of the game, and since we are always in action, we are very, very far from a poker tournament where often we’ll only play two or three hands per round at most. Three-card straights and flushes are not valid on the top line, therefore the best possible hand you can make there is trip aces, which has to be beaten by the middle line, which then has to be beaten by the bottom line. Needless to say it is extremely rare to actually be able to place trip Aces on the top line (lol)! This order of lines is the basis of OFC poker, and would also apply to all other variations of the game that eventually came along except for Deuce-to-Seven OFC, which we will explore in more detail later. You want to know what happens if you don’t respect that order? Let’s say I have placed a full house in the middle and a flush on the bottom line — that would automatically make me “foul” my hand and make it invalid, causing me to lose all my lines against my opponent. In closed Chinese poker, this would be similar to a misclick, since I have all my cards in hand and all the luxury of positioning them where I want. But you’ll discover that in the “open” version of the game (OFC), you continually have to take risks and it is quite frequent to foul your hand. So, how does it work exactly? Well, once my 13 cards are placed in three lines, I will compare them with my opponent’s three lines and the objective will be to have the better hand on every line. Let’s say I have a flush on the bottom line and you have a full house, you win that line for 1 point. Then I have two pair in the middle and you have a straight, so you also win that line for 1 point. Then on top I have and you have , so I win that line for 1 point. Overall, you made one point over me for the lines — but wait, there are also some bonuses applicable in OFC. In this particular case, having a full house in the back gives you 6 points and a straight in the middle gives you 4 points, so you made 10 points in bonuses. On my side, my flush in the back gives me 4 points, so as far as the bonuses go there is a difference of 6 points in your favor. Add that to the 1 point you got for the lines, and that makes a total of 7 points for you on the hand. If we were playing €100 per point, I would give you 7 chips of €100 from my stack; if we were playing for €1,000 per point, that would be €7,000 going your way. We would then do the same process individually with the other players in the game (maximum 4) before jumping to the next hand. It might seem tedious, but I assure you that you quickly get used to all the calculations, and the game is extremely fast! 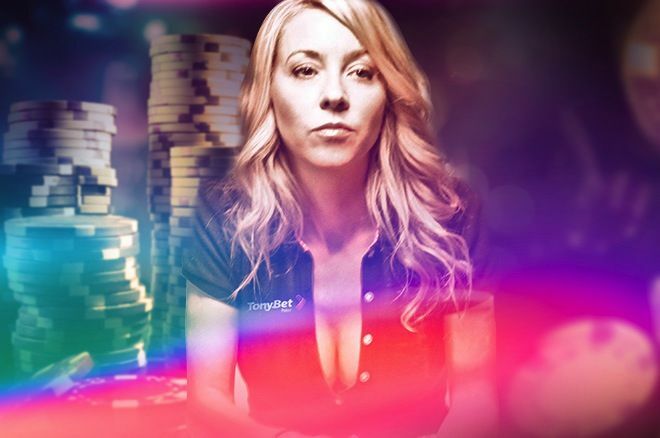 It moves even more quickly online, and when you play on Tonybet Poker, it all gets calculated instantly for you. I also need to point out right away that there is an important bonus associated with “scooping” your opponent which happens when you successfully beat all three lines of your opponent. In the above example, let’s say you had on the top line instead of . You would then have won against my , along with the two other lines. Instead of winning only 1 point for the lines (for 3 points total), you would get an additional bonus of 3 points for your scoop. If you do the math, you had your 6 points bonuses over me in bonuses, plus now 6 more points for the scoop for a total of 12 points. At €100 per point, I would now owe you €1,200 instead of €700 — a big difference of €500 for that one little line. We'll rendez-vous next week for the next part of the “OFC No Mercy Little Guide.” Meanwhile, you can try the game right now by downloading Tonybet Poker and using the bonus code NOMERCY to receive 100% bonus up to €500 and a free ticket for a weekly Pineapple NoMercy Ride tournament!